Tabbouleh has to be one of my favorite salads to make on a weekly basis. After visiting the farmers market on Saturday, (Little Italy, my last post) it has inspired me to write this post and include many of the vendor’s products I purchased that day. Bulgur wheat is a nutritional staple in the Middle East, which consists of wheat kernels that have been steamed, dried, and crushed. 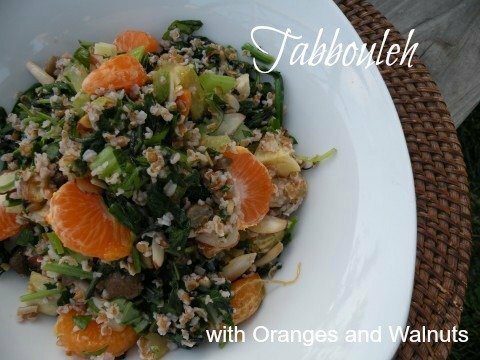 Tabbouleh can be a base recipe for many various dishes for your dinner table. Add your own favorite vegetables and fruits. Place bulgur in a large bowl and add boiling water, 1 tablespoon olive oil, orange juice and 1 teaspoon salt. Cover and let sit for one hour. Place on a sheet pan and toss with 1 tablespoon of olive oil. Add salt and pepper and roast in the oven 45 minutes or until soft at 350 degrees. In a frying pan place 1 tablespoon of olive oil and saute mushrooms and garlic together until soft. Remove and place in a small bowl to cool. Add 1 tablespoon of olive oil to the same pan and saute leeks, greens,salt, and pepper until slightly wilted. Greens will reduce to 1-1/1 cups. Add to mushrooms and let cool. When greens have cooled add to bulgur. Add potatoes, almonds, and oranges, orange juice, and 2-3 tablespoons of olive oil. Combine gently. Taste for extra seasonings.